A priest from the Vatican was on pilgrimage to Medjugorje. At the time the apparitions were taken place in a small room inside of the church. This priest was allowed into the room during the apparitions. During the time the Medjugorje visionaries knelt (indicating Our Lady was now present,) the priest snapped a picture. Now back at the his post in the Vatican, the pictures were developed. He saw this picture which he had no recollection having taken. 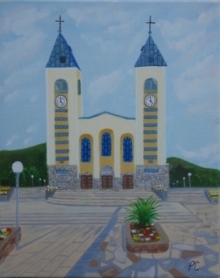 He sent to picture back to Medjugorje with some nuns going on retreat and ask they show it to the visionaries. The visionaries who saw the picture said, "Yes this is Our Lady, but she is much more beautiful than this."